The latest and greatest tourist attraction that London has ever seen has now arrived in Royal Docks. The “Royal Docks cable car”, or to give it’s full marketing, co-branding, we paid for it name, The Emirates Cable Car has arrived on schedule and is now waiting to take you across the River Thames. The Emirates Cable Car runs between the Royal Docks and North Greenwich (which for those who live north of the river, is south of the river, don’t worry it’s not that bad… honest ;-)), the journey time is less than 10 minutes. 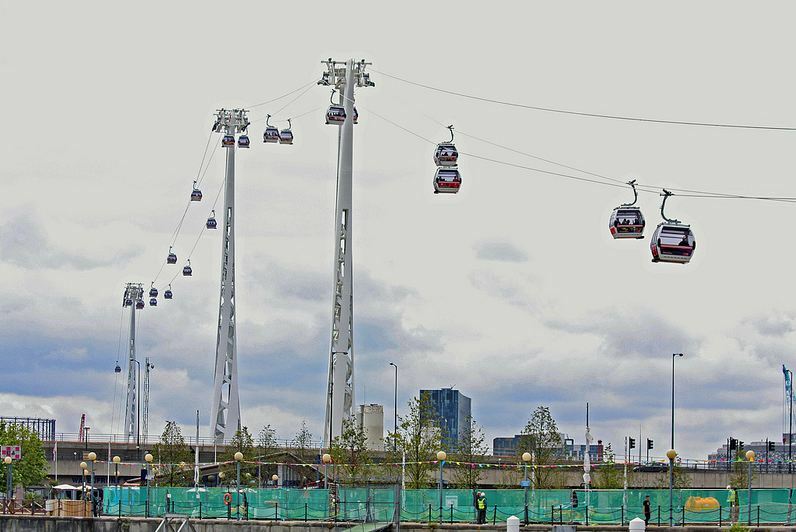 The Royal Docks cable car terminal is close to Royal Victoria DLR, and walking distance from the Excel Exhibition Centre. Whilst the North Greenwich cable car terminal is easily accessible from North Greenwich Underground Station (Jubilee Line), has its own river boat service and is also next to the O2 Arena (also known as ‘The Dome’). Not only is the Emirates Cable Car a convenient and fun way to travel across the river, but it also provides stunning views on the area as well as the ability to see for miles around!. When dusk falls, you can take in the impressive nightscape and bright lights of the Canary Wharf sky scrappers, yes there are people still working at that hour, and also those with good eyesight might catch a glimpse of the London 2012 Olympic park, London City Airport and beyond. Ok now you know where it is, what are you waiting for? Come out eastside, put on your salopettes, grab your ski gear, put some banging cowbell alpine tunes on your beatbox and take London’s only cable car to imaginable altitude (ski outfit optional :-)). The Emirates Cable Car system is 1km (0.62 miles) in length, the highest elevation on the Emirates Cable Car is 295ft (90m). It Is capable of carrying 2,500 passengers per hour in each direction, as well as carrying bicycles, passengers can also pay for a journey using their Oyster Cards. The approximate speed of the cars is 6m/s. There are 34 gondolas and each is capable of carrying 10 passengers. A computer animation of what the Emirates cable car was going to look like.